Complete FXᴾ system plus Dual-Arm System, Multichannel pipettor and Span-8 pipettor. 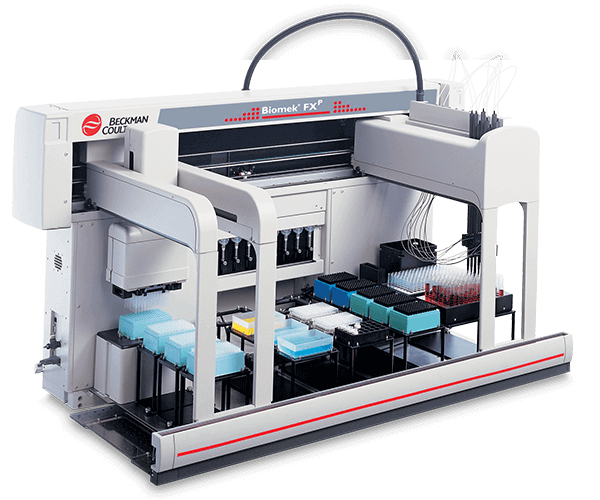 Equip the high-capacity deck with Automated Labware Positioners (ALPs) suited to your application for a dedicated workhorse system. Choose a 96- or 384-Multichannel pipetting head or opt for a pin-tool system for high-density replication tasks. The Multichannel pod heads are easily swapped out for maximum flexibility and system reconfiguration as your needs change. Use the Span-8 configuration with independent well access for tube-based operations and where flexible access to wells in a plate is needed. The Biomek FXᴾ Incorporates a wide range of next-generation features in a condensed design. The Biomek FXᴾ sets a high bar in performance and flexible laboratory solutions. It puts every aspect of liquid handling, including pipetting, dilution, dispensing and integration, into a single automated system as powerful as it is efficient and economical, while staying incredibly flexible for the changing needs of your lab. Includes our robust Biomek software and our ongoing applications development.